Who wouldn't fall in love with the intelligent, playful, loud Siamese cat? Interested in Siamese cats? Who wouldn't be? With their sleek coats, distinctive markings and angular heads, Siamese are some of the most striking cats around. Not to mention their electric-blue eyes. Types of Siamese cats -- and kittens -- fall into categories based on their coloring. The Cat Fanciers' Association very clearly defines the Siamese breed standard. It recognizes only four colors: lilac point, chocolate point, blue point and seal point. Points -- flashes of color on the ears, face, feet, legs and tail -- should be sharply defined. 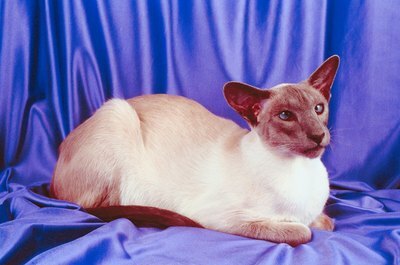 The standard Siamese has a delightfully triangular head, big blue eyes that dip inward toward the nose, and a short coat. They're muscular, athletic-looking cats. Ah, the seal-point Siamese. His coloring came first, as far as recognition goes. His body can range from pale and creamy to fawn in color and sometimes darkens as he ages. His points should be a deep brown -- about the color of a seal -- and his little toes and nose should match. The fur on his tummy may be lighter than the fur on his back. Don't be surprised if you find it difficult to tell apart a chocolate point from a seal point. His points are also dark brown. The difference? The chocolate points are lighter and warmer in tone. His body color also tends to be lighter than the seal point's body -- cream colored rather than fawn. If you still can't tell them apart, check the pads of his feet and look closely at his nose. If the cat is a chocolate point, they'll be pinkish or have cinnamon undertones. There's no mistaking a blue-point Siamese for chocolate or seal. The fur on the tips of his tail, ears and face is, as you can probably guess, bluish -- most often a bluish gray. His body also has a bluish cast to the white fur, though his belly may not. The blue-point boy's coloring received official recognition in 1934. Poor lilac-point kitties. This type of Siamese was the last to receive recognition, this time in 1955. His points are the lightest of any other Siamese and are pale pinkish, grayish or purplish in tone. His body coat is also lighter than a seal point's, chocolate point's or blue point's. His feet and nose should match in coloring. While only four colors are officially recognized, breeders have produced myriad point shades in Siamese cats, from lynx to tortoiseshell to orange and everything in between. Keep in mind that point colors don't develop immediately -- Siamese kittens are typically cream colored or white, with no points. In addition to coloring, there are two -- or three, depending on who you ask -- body types. The Cat Fanciers' Association recognizes only the wedge-shaped head build, which some people call extreme or modern. The applehead, or traditional, Siamese is heavier, with a rounder head and eyes. It looks a lot like a typical domestic short hair with Siamese points. Finally, there's the old-style Siamese. This type falls somewhere in between the modern and applehead. Their heads are angular but not as extreme as the modern Siamese. Are Tonkinese Cats More Loving Than Siamese Cats? What Color Are Siamese Kittens Born?